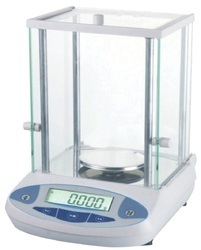 Balances are designed to meet the specific weighing requirement in the Laboratory Working Environment. These balances come in precision designs and operating characteristics that allows making quick and accurate measurements. Further, these balances can also be tubes to transfer data to computer for further analysis as well as can have piece count functions and hopper functions. 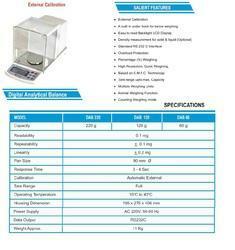 With end usage of these scales in precision weighing applications in laboratories, these also offer excellent value of money invested. Here, our expertise also lies in making these available in both standard and custom tuned specifications. 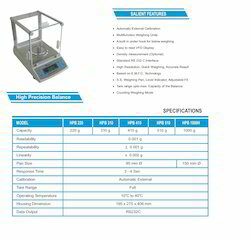 The range offered includes Analytical Balances, General Purpose Electronic Balance, Laboratory Balances and Precision Weighing Balances. To furnish the diverse requirements of our clients in best possible manner, we are engaged in offering Electronic Balance. Our offered electronic balance is the electronic balances that generate current proportional to displacement of pan and are ideal for general purpose weighing applications. Offered electronic balance is developed at our premises utilizing quality tested material, in conformity with set industrial norms. Capacity: Approx 220gm/ 300 gm /600gm. Tare Range (Subtractive): Full of Capacity. General Purpose Electronic Balance are the electronic balances that generate current proportional to displacement of pan and are ideal for general purpose weighing applications. These also feature all digital design with digital readouts coming with latest in electronics and analytical balance technology. We make these available in different models for meeting different end application needs. 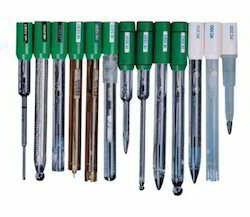 These are used in application programs including Net Total - Counting; Tare; Weighing in % formulation and others. Application programs: Tare; Net Total: Counting; Weighing in % formulation; Calculating. 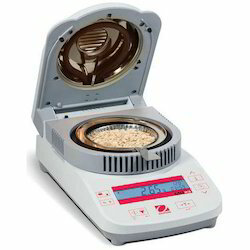 Selectable weighing units: Gram and mg. Round 20cm(8") dia single plate, electrically operated.a) Complete with three step rotary switch, plug and cord.b) Same as above with double plates of 8" dia.c) Hot plates rectangular electrically operated complete with 3 step switch with cord and plug. 1. 300 x250mm (12"x10") 2. 400x250mm (16"x10") 3. 450x300mm (18"x12") 4. 600x180mm (24"x18"). Note: Energy regulator can be fitted in any model at extra cost. In keeping with our theme of client satisfaction, we are offering Earthing Electrode to our clients. It is compatible with DG sets. It is used for offering low resistance path in ground to any fault and leakage current which ensures long life and excellent performance. It is equipped with conductive rod. 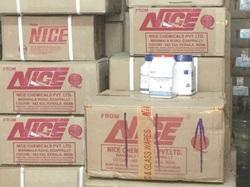 Offered range of this product is resistant to chemicals and is offered at cost effective price to our clients. Our organization is a topmost provider of Vane Anemometer to our clients. It is used for measurement of air velocity, air volume, and temperature in imperial or metric units. 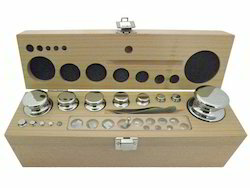 It is high quality instrument and offered to our clients in different options. Customization is available too on this range. Last but not the least, we deliver this within specified time frame. We are noted manufacturer, exporter and supplier of optimum grade Variable Volume Micropipette. 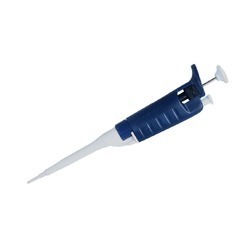 The offered pipette is a laboratory tool used for measuring volume of liquid for clinical diagnostics, control analysis and other laboratory work. Our offered pipette is provided in several designs for various purposes to measure different level of accuracy. We provide this pipette to our clients in safe and hygienic packaging options for safer delivery at user's end. To furnish the needs of our customers in the most effective manner, we are engaged in bringing forth a huge gamut of Digital IR Moisture Balance. Using cutting edge tools together with finest grade basic material and advanced tools and techniques, these offered balances are in compliance with the standards laid down by the industry. Apart from this, our customers can buy these from us at leading industry costs.